Each month, Revolutionary Paideia recognizes one person who embodies the “unsettling, unnerving, and unhousing” spirit that founded this site. Tony La Russa, the Manager of the St. Louis Cardinals, has been selected as the Revolutionary Paideia October 2011 Person of the Month. Under the great leadership of Tony La Russa, the St. Louis Cardinals won the 2011 World Series. At no point in the season was this team considered to be the favorites to win the World Series. For many baseball fans, they found it would be difficult for the St. Louis Cardinals to even make the playoffs. Indeed, it was a challenge for the Cardinals to make the playoffs but they did. Although much of the credit will go to the players, and the players are well-deserving of much of the credit for winning the World Series, of course, the significant role Tony La Russa played in helping the team to achieve victory in the World Series should not be overlooked. Without the excellent managing of the pitching staff and the batting lineups throughout the regular season and World Series, the Cardinals would not have even had an opportunity to win the World Series. Tony La Russa is the only Major League Baseball (MLB) Manager to retire after winning a World Series. More people, however, need to learn how to stop doing the great things they do while they are still great at doing them. One of the best times to stop doing what you have been doing for so long is when you’re at your greatest at what you are doing. Don’t wait until you become horrible at what you do before you stop doing it. Tony La Russa has been a MLB Manager for well over 30 seasons. He has won three World Series as a MLB Manager. He revolutionized the use of the closing pitcher (“the closer”). La Russa should be applauded for his tremendous accomplishments and commitment to excellence for well over 30 seasons in MLB. For those of us who love MLB, we can appreciate watching Tony La Russa manage his teams like no other Manager has been able to do. What has really been amazing about his success with the St. Louis Cardinals is his team has never been considered the best team in MLB. However, he has led the St. Louis Cardinals to two World Championships. 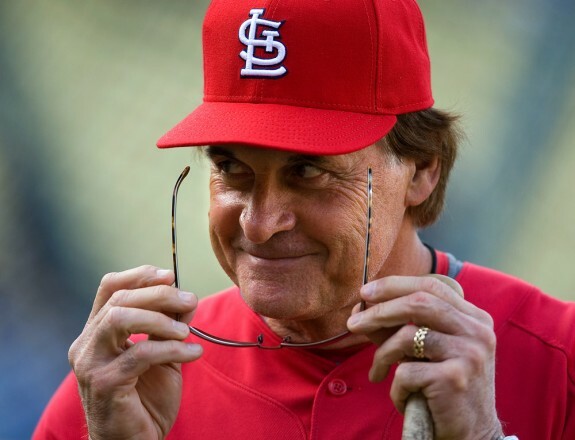 The St. Louis Cardinals will have a difficult time replacing Tony La Russa. True baseball fans will miss him. Without question, Tony La Russa provided us with a positive example of how to be a successful MLB Manager and how to do it with class. It is with great pleasure to name Tony La Russa the Revolutionary Paideia October 2011 Person of the Month. I thought you’d be honoring more deserving people like we who support your writing endeavors. Reciprocity is a virtue you dearly lack. I’m only joking! Congrats to Mr.Russa and his achievements. Oh damn he is already retiring. I don’t blame him.